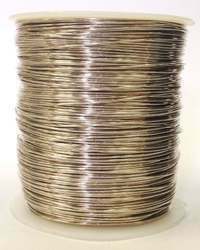 Nickle Silver Strip is a copper-based alloy that contains from 10% to 45% zinc and from 5% to 30% nickel; most often alloyed with brass. It is yellowish brown in colour. 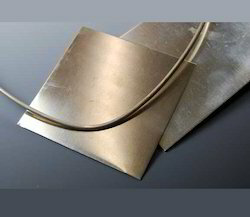 Sometimes tin and lead are also added to improve the casting properties of the metal. There are many different formulations of alloys which fall within the general term of "Nickel Silver". All contain copper, nickel and zinc, while some formulations may additionally include antimony, tin, lead or cadmium. A representative formulation is 65% copper, 18% nickel, 17% zinc. Composition: 55-72 Cu, 12-18 Ni, balance Zn / Copper-based alloy that contains from 10% to 45% zinc and from 5% to 30% nickel; most often alloyed with brass. 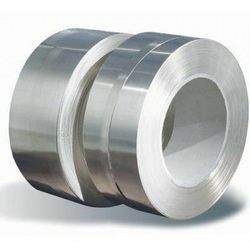 We are engaged in offering German Silver Wire to the clients that are made of nickel alloys. We are offering Nickel silver, also known as German Silver Sheet. It is a copper alloy with nickel and often zinc. The usual formulation is 60% copper, 20% nickel and 20% zinc. In fact, all modern, commercially important nickel silvers (such as those standardized under ASTM B122) contain significant amounts of zinc and are sometimes considered a subset of brass. Nickel silver is a copper-based alloy that contains from 10% to 45% zinc and from 5% to 30% nickel; most often alloyed with brass. It is yellowish brown in colour. Sometimes tin and lead are also added to improve the casting properties of the metal. Looking for German Silver Products ?